Conor McGregor argues in favor of more weight classes being added to the UFC including a 165-pound weight class. Conor McGregor has won two UFC titles in two different divisions but if he gets his way, he’ll have the chance to win a lot more. Ahead of his upcoming fight against Khabib Nurmagomedov at UFC 229 on Saturday night, McGregor was asked about the constant push for the promotion to introduce a new 165-pound weight class. Just recently, former opponents Nate Diaz and Dustin Poirier have been pushing for a 165-pound title to go up for grabs when they fight at UFC 230 in November and more than a few fighters have joined them asking for the division to be made. UFC president Dana White has shot down the idea repeatedly but McGregor feels like adding that weight class — and several more — would only be beneficial to the fighters and the promotion. ”There should be many more weights to choose from. 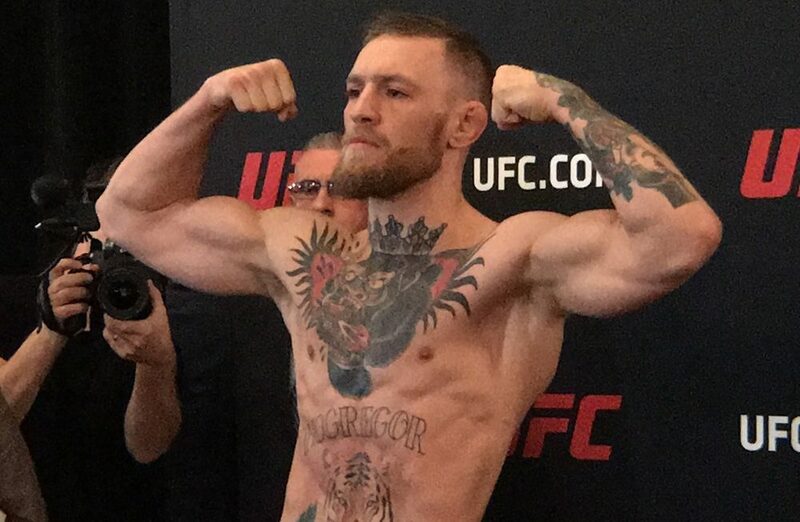 155 [pounds] to 170 [pounds], it’s a 15-pound gap,” McGregor said to the Mac Life on Sunday. “Boxing is every three pounds there’s a new f–king division. So I mean, there’s definitely space for more divisions and something needs to be done so we can keep an eye on the way people are cutting weight and manage it and make the sport much more enjoyable for the athletes that are actually competing. When he first arrived in the UFC, McGregor fought as a featherweight but these days it would appear 145-pounds would be far in his rearview mirror considering how tough it was to cut that weight without spending the past two years fighting around 155-pounds. McGregor admits that there are two major factors that would get him to leave the sport of mixed martial arts sooner rather than later and weight cutting is definitely one of them. ”If there’s two things that’ll keep me away from this game, it’s the intense media obligations and the weight cuts and that’s it,” McGregor said. “They always come together at the same damn time. There’s a lot of work involved in the media, and a lot of different type of energy. And then of course factor in you’re cutting weight. It’s not enjoyable at all. McGregor probably has more pull than any other fighter in the sport right now but whether his influence is enough to change White’s mind on adding another division remains to be seen. Obviously, McGregor seems more than ready to step up to that challenge but for now the UFC doesn’t seem wiling to add one more weight class much less several of them.